News in overnight from Rich Lazzara at Lazzara Lenton that his central listing, the 24m skylounge motor yacht Angela D is sold in an in-house deal. Built by Lazzara in 2003, Angela D has been professionally maintained since new and has an extensive list of upgrades, with the largest hydraulic swim platform of any Lazzara. An exotic cherrywood interior offers accommodation for 8 guests in a master suite, two VIP staterooms and a twin cabin. 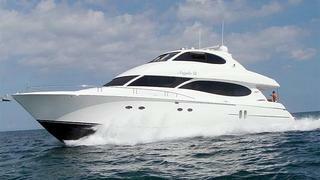 Twin 1300hp MTU engines give her a maximum speed of 30 knots. Angela D was asking $1,895,000.